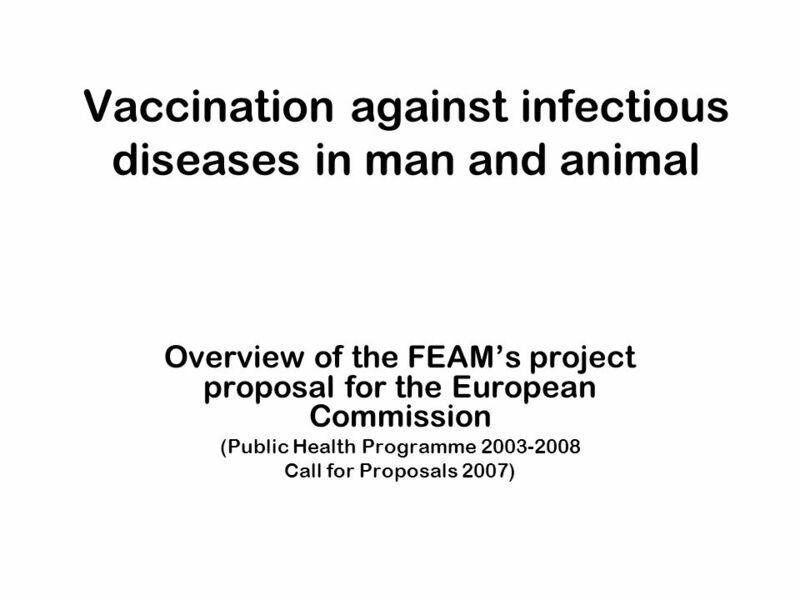 Vaccination against infectious diseases in man and animal Overview of the FEAMs project proposal for the European Commission (Public Health Programme 2003-2008. 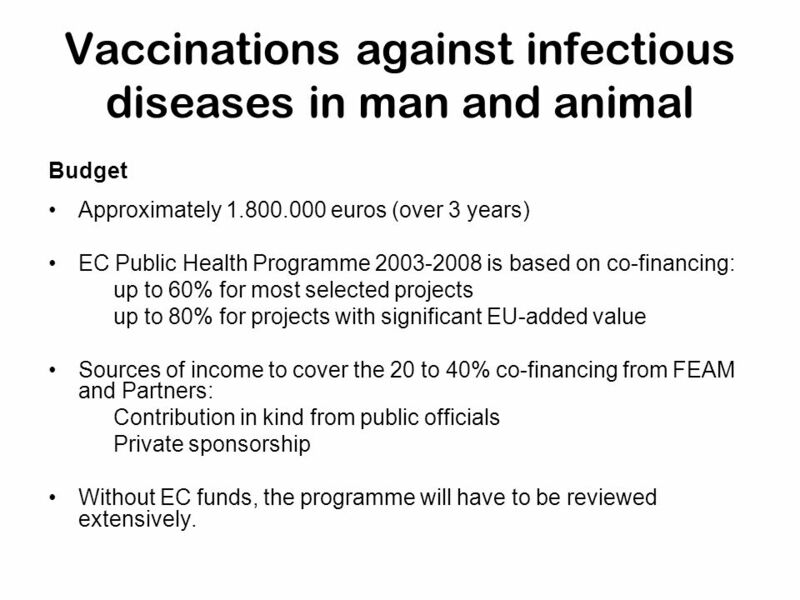 6 Vaccinations against infectious diseases in man and animal Budget Approximately 1.800.000 euros (over 3 years) EC Public Health Programme 2003-2008 is based on co-financing: up to 60% for most selected projects up to 80% for projects with significant EU-added value Sources of income to cover the 20 to 40% co-financing from FEAM and Partners: Contribution in kind from public officials Private sponsorship Without EC funds, the programme will have to be reviewed extensively. 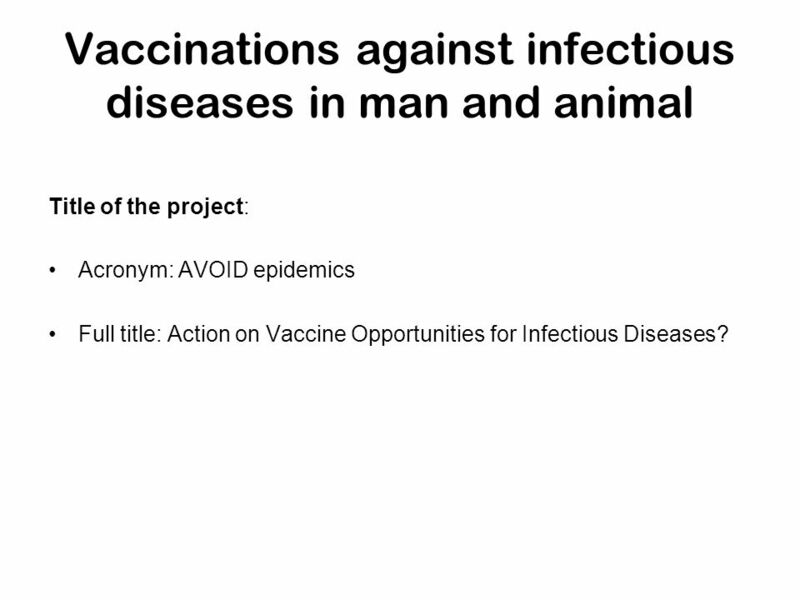 7 Vaccinations against infectious diseases in man and animal Title of the project: Acronym: AVOID epidemics Full title: Action on Vaccine Opportunities for Infectious Diseases? 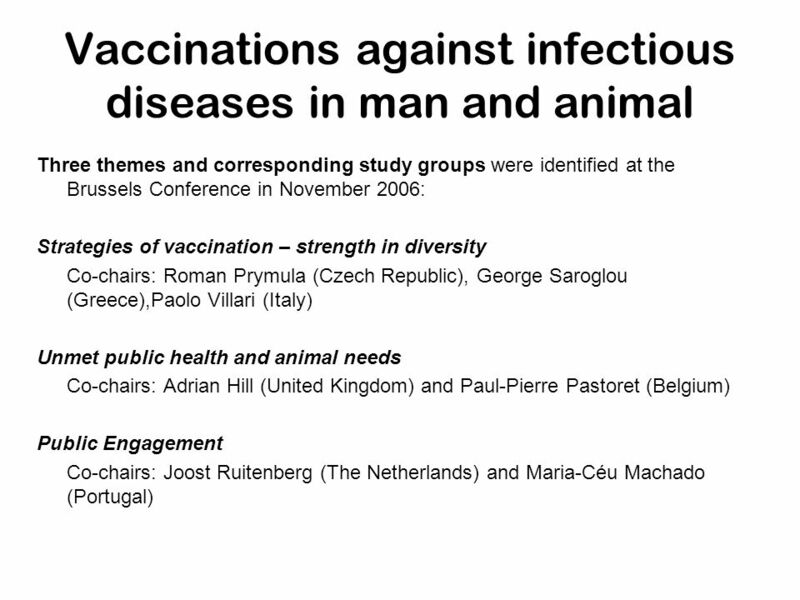 Download ppt "Vaccination against infectious diseases in man and animal Overview of the FEAMs project proposal for the European Commission (Public Health Programme 2003-2008." 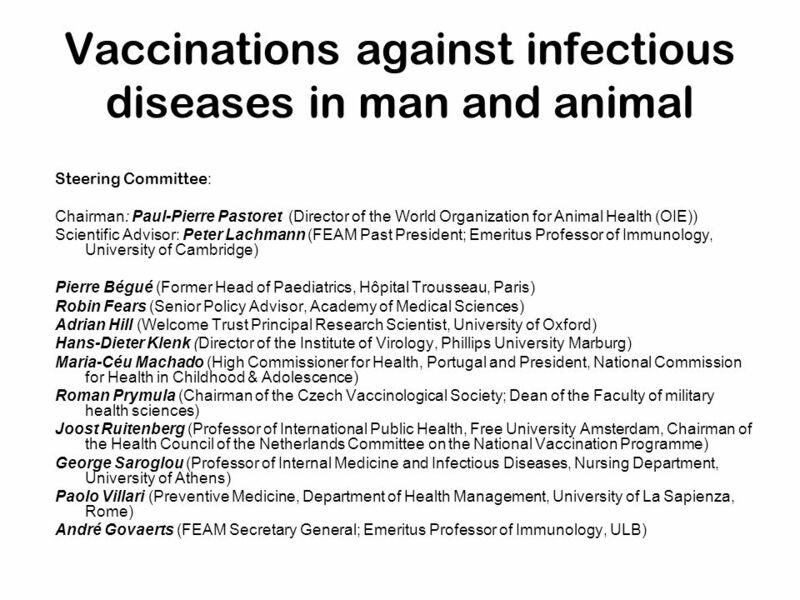 EASAC – European Science Advisory Council Professor Sir Brian Heap President. Brain Gain Programme: Engaging the Diaspora and Affecting R & D Prof. Dr. Myqerem Tafaj – National Coordinator Bernard Zeneli – Programme Manager Rezarta. 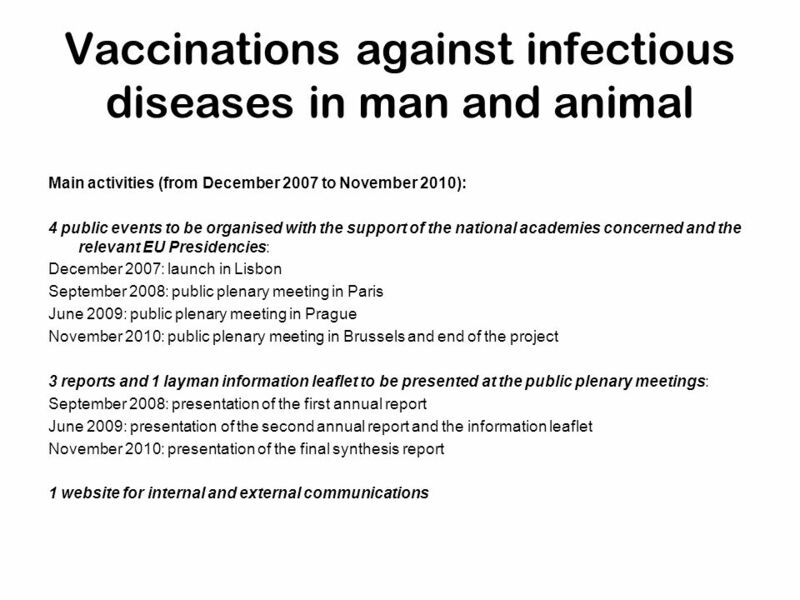 Contents of the EHES Joint Action Hanna Tolonen EHES JA Kick-off meeting, 21 January 2010, Luxembourg. 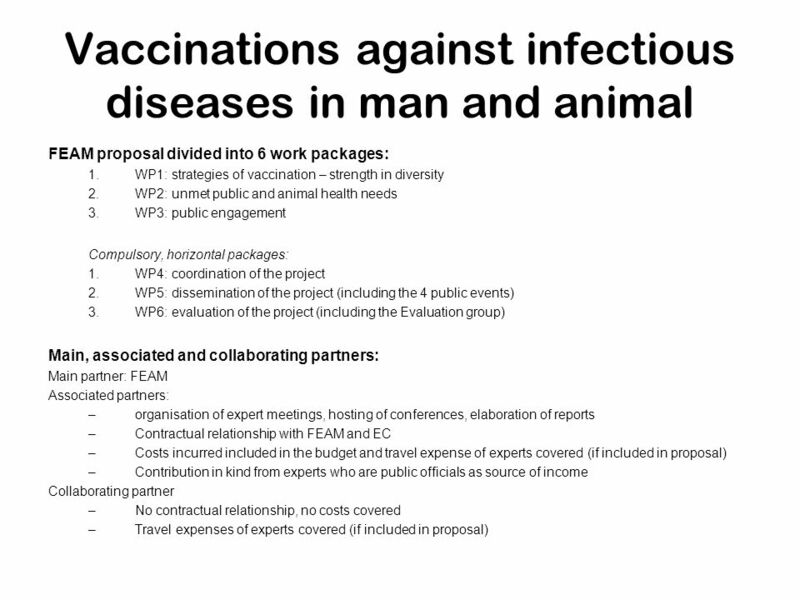 EPP-ED WORKSHOP ON RULES OF PARTICIPATION ON THE IMPLEMENTATION OF THE 7 th FRAMEWORK PROGRAMME ( ) Viewpoint from the European University Association. European Institute of Public Administration (EIPA), Maastricht E. Best © EIPA, 2008 The European Institute of Public Administration (EIPA): Learning to.